Party Ideas by Mardi Gras Outlet: Memorial Day Pound Cake Dessert for effortless entertaining! Memorial Day Pound Cake Dessert for effortless entertaining! For Memorial Day, decorate with touches of red, white and blue, fly your American Flag and serve some all American favorites like fried chicken or barbecue. End your meal with a fun red, white and blue inspired dessert. 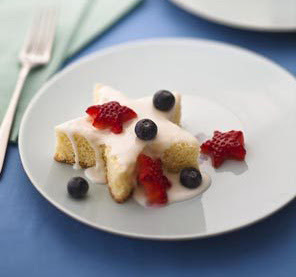 This festive star spangled dessert that requires no baking was featured in Better Homes and Gardens July 2009 magazine. It is easy to prepare and looks so festive. This is the perfect light summer dessert to end your patriotic Memorial Day meal. Using a star shaped cookie cutter (3”), cut slices of pound cake into star shapes. To prepare the strawberries, cut off the green tops, slice them in half top to bottom. Use the 1” star cookie cutter to cut out star shapes. Layer star shaped cake on a dessert plate, top with star shaped strawberries and blue berries. Drizzle on a sugar glaze or whip cream. Precious, super easy and yummy!